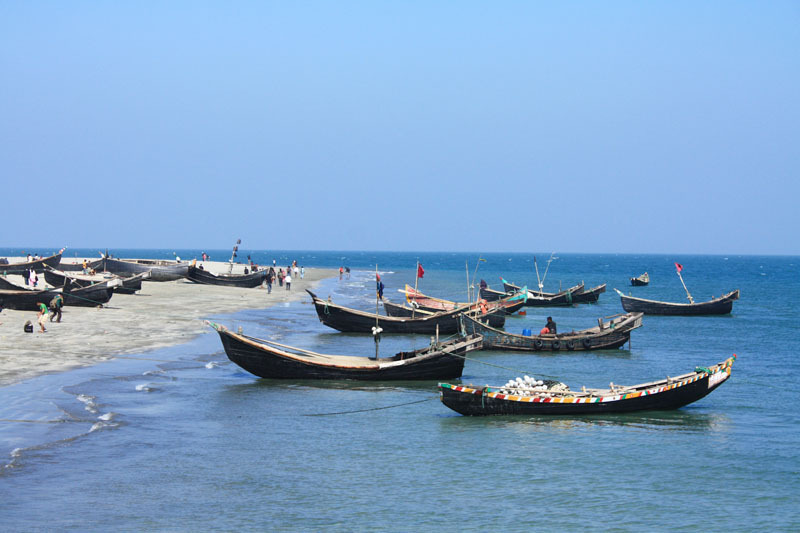 You probably already know that Bangladesh is famous for experiencing tiger safaris in the Sundarbans, riding on The Rocket for a Bangladeshi boat trip or for surviving a hair raising rickshaw ride on the crazy streets of Old Dhaka. But did you know that there are ‘off the road’ hidden gems waiting to be visited? This is what all ruins should be like. It seems like something out of the fairy tale books or movies. There’s none of your fancy reconstruction or meticulous renovation going on here. Oh no. It’s just a crumbling old royal palace being eaten up slowly by the surrounding vegetation. It really looks like something out of The Jungle Book (Disney’s best-ever animated film). You wil did get a great guided tour from the extremely enthusiastic English-speaking caretaker who helps brings the whole place to life for the handful of tourists who make it this far. How to: Bus from Mymensingh, then follow the signs from the main road. 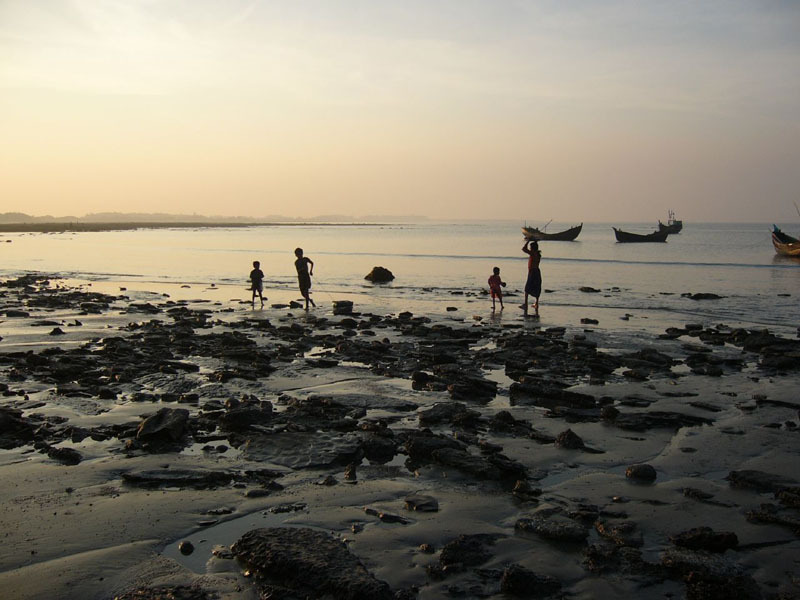 With its small-village atmosphere and collection of serene Hindu and Buddhist temples, the island of Maheskhali makes a wonderfully peaceful escape from the brash beach resort of Cox’s Bazaar. But it’s the short trip over to the island that’s the real gem. First you have to negotiate the long and worryingly rickety wooden pier that winds its way over marshland to the boat dock. 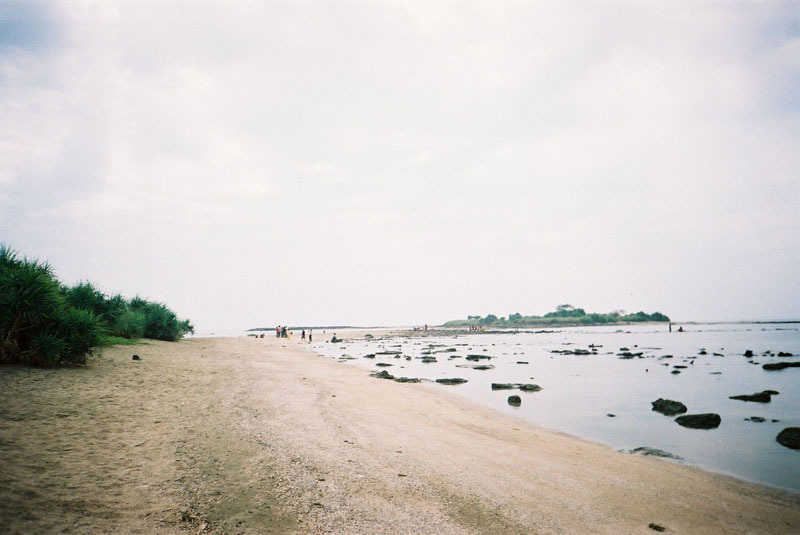 Once at the dock, you need to hop your way across a string of rowboats to get to the boat that will take you to the island; either a nippy little speedboat or, if you’re lucky, a large converted wooden fishing boat that ferries locals across. 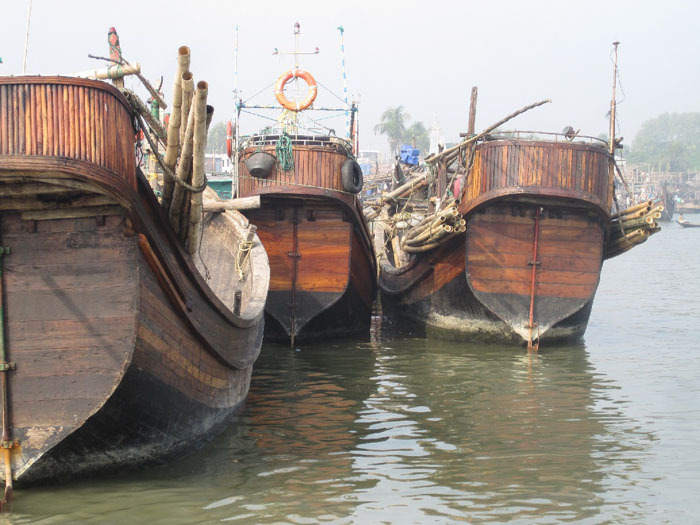 You’ll have to dodge dozens of pirate-ship lookalike fishing boats as you leave the dock and, soon after, you’ll pass the huge and highly pungent fish market that serves all those fancy hotels in Cox’s Bazaar. Next along the riverbank is the small boat-building yard, where those pirate-ship pretenders are made. And finally, just before you head out to sea, you’ll pass a series of fascinating ice-making houses where huge blocks of ice slide down rollercoaster runners and into the boats that wait to ship them off to…well, to anyone who doesn’t have a fridge-freezer, I guess? 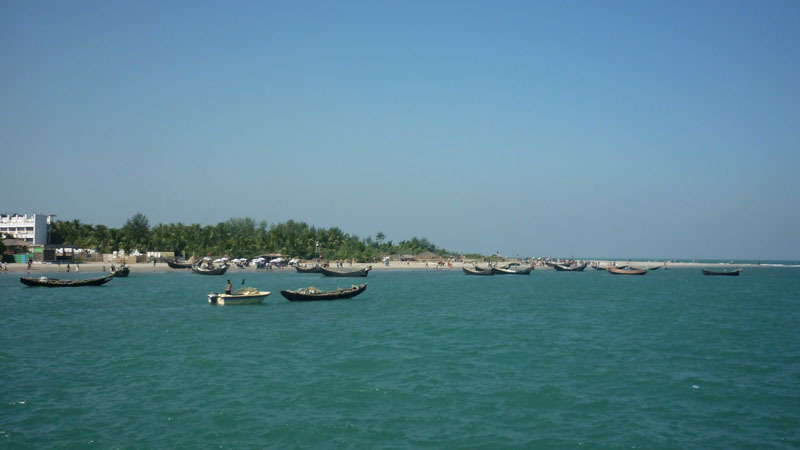 How to: Catch a boat from the jetty at Cox’s Bazaar. 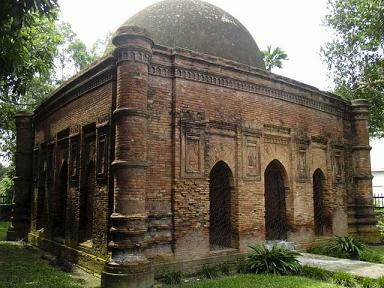 Thought to be Bangladesh’s oldest surviving mosque, Goaldi is hidden away amongst the farmland surrounding Painam Nagar (more commonly referred to as Sonargaon), a small abandoned town close to Dhaka where you can find the crumbling remains of dozens of 19th-century mansions once owned by wealthy Hindus. The mosque too has been abandoned, and is no longer a place of worship, but it makes a worthwhile side trip if you’re visiting Painam Nagar, and is a great excuse to venture off the beaten track and into the countryside without having to stray too far from Dhaka. How to: Coming back out of Painam Nagar (which is reached by bus from Dhaka), turn right then immediately left, then just keep walking. The road becomes a path. The buildings become crops. And if you get lost just keep asking for ‘Goaldi Masjid’. Very few Bangladeshi tourists seem to have heard about this mosque so you’ll have to ask the locals. It’s not just tigers that hide in the forests of Bangladesh you know. There are wild elephants here too, and one of the coolest places to go looking for them is this little-known game reserve, which stretches down to Bangladesh’s furthest southern tip. Your chances of seeing an elephant are of course slim (best chance is in the evening, which unfortunately is also the best time for getting lost! ), but hiking into the hilly forest is an adventure in itself. 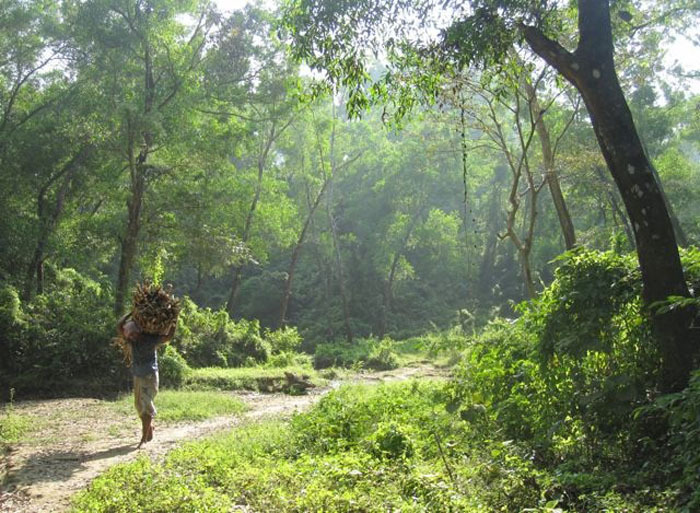 Chances are you’ll be the only tourist walking the forest trails, although you may bump into local tribespeople as they venture into the hills to collect firewood. There are guides available, but they don’t speak English and they’re often nowhere to be seen. The trails, though, are marked on wooden signboards (albeit in Bengali only), so it’s reasonably easy to find your way around. How to: Take a Teknaf-bound bus from Cox’s Bazaar. Get off when you see the sign with the elephant on it on the side of the road, about 10km before Teknaf. If you go too far, you can catch a shared auto-rickshaw back to the reserve from the bus stand in Teknaf. 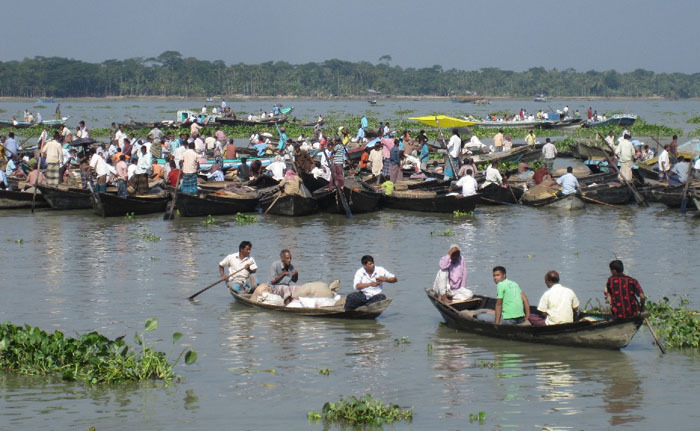 Like the more famous floating markets in southeast Asia, the small floating market at Banaripara near Barisal is where locals who live in this river-laden part of Bangladesh come to buy and sell groceries without ever having to step off their boats. This particular market deals almost entirely in rice. Not much use for the average tourist, true. 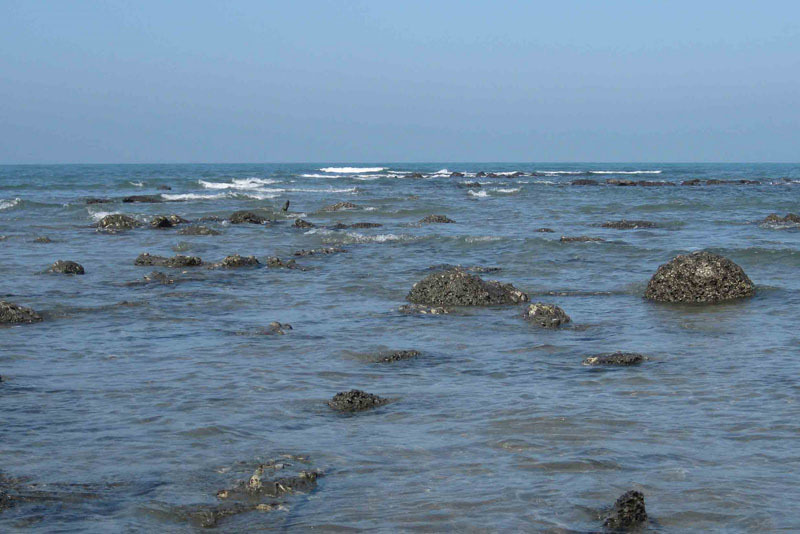 But it does make a fascinating, and undoubtedly unusual side trip from your forays into southern Bangladesh. Saturday is the busiest market day here. How to: Bus from Barisal. 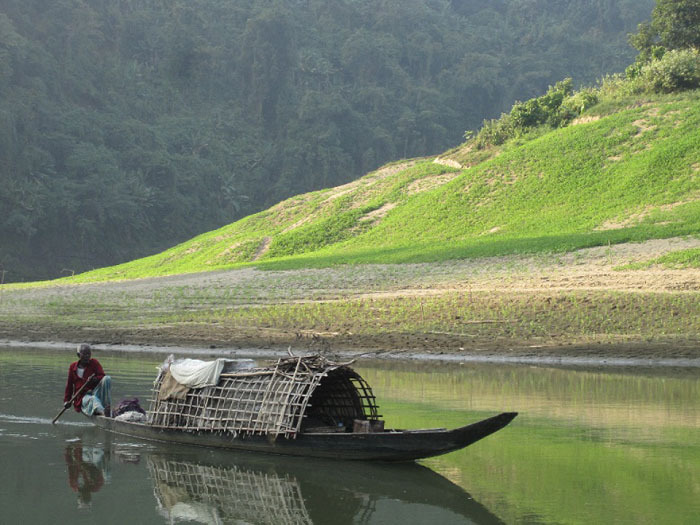 It’s rivers galore in Bangladesh, and taking boat trips on them is an undoubted highlight. They’re all fun, especially if you manage to hitch a ride in one of the small wooden fishing boats that ply pretty much every waterway here. But some river trips are particularly special. 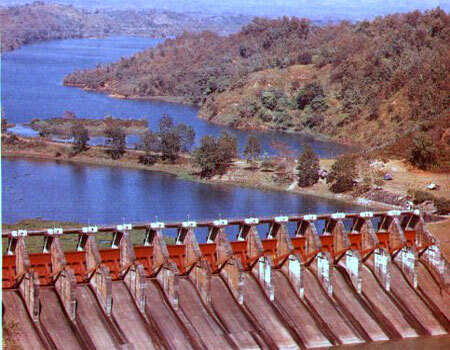 The stretch of the Sangu River that runs between Ruma Bazaar and Bandarban is one such waterway. It’s special for two reasons. One, the scenery here is stunning. 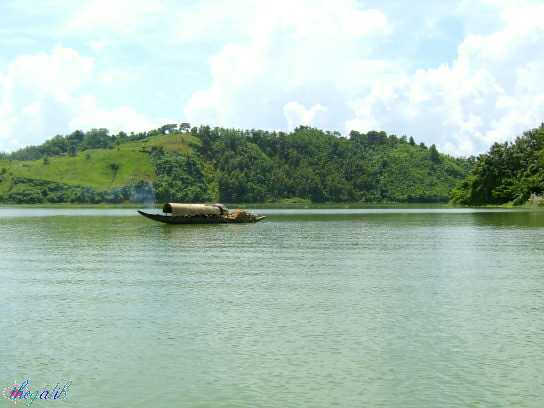 This is the Chittagong Hill Tracts where instead of flat-as-a-pancake paddy fields you’ll find dramatic rock faces rising up from the water’s edge, backed by forested hills teeming with wildlife. 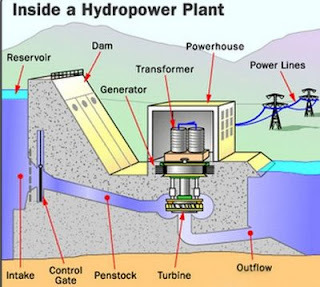 The second reason is that it’s tougher to get to than your average Bangladesh river. Local tensions mean that foreigners need permits (and sometimes armed guards!) 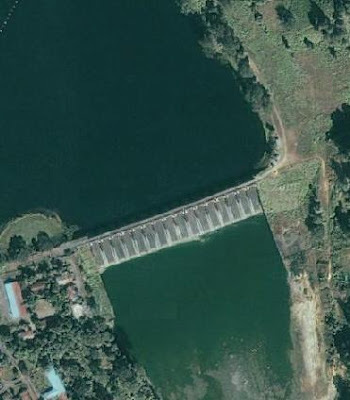 to visit the area. I was able to get here on my own, but it was difficult to persuade a boatman to give me a ride for fear of river bandits. One boatman eventually agreed, and luckily we never saw those bandits, just breathtaking scenery, and hours of peace and quiet. 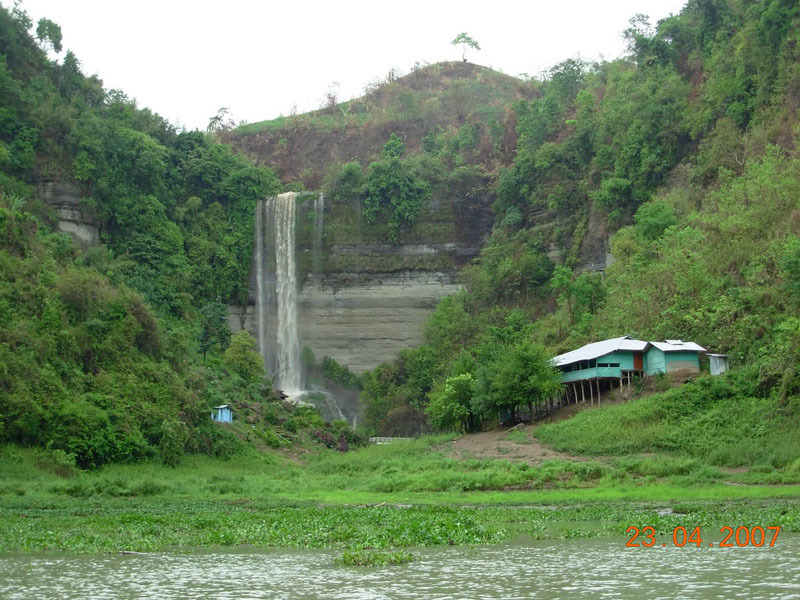 How to: Bus from Bandarban to either Ruma Bazaar or Khokhonjiri (a riverside jeep stand situated an hour before Ruma), then find a local boathand to take you back to Bandarban by river (four hours from Khokhonjiri, six hours from Ruma). Your chances of getting a boat will increase if you have a local guide with you. 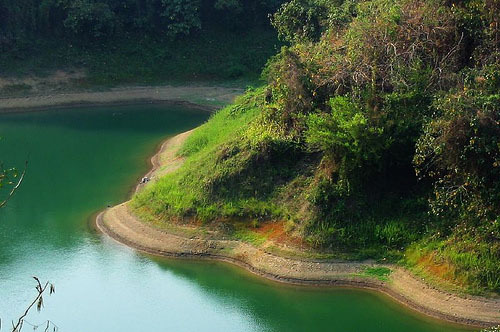 The excellent Hillside Resort in Bandarban can arrange one. China Clay Hills – getting there is an adventure in itself! The cool turquoise waters here are reminiscent of a high-altitude mountain lake, but in fact the China Clay Hills are no more than small mounds, raised just a few metres above the level of the surrounding farmland and river systems. It’s an extremely photogenic spot, and a lovely place for tree-shaded picnic, but the main reason to venture this far north is for the journey itself: take a tranquil three-hour rowboat trip up the Someshwari River or a bone-rattling, but ever-such-fun two-hour rickshaw ride, crossing the river in a small wooden ferry before passing through a number of remote villages en route. How to: Bus from Mymensingh to Birisiri, where you’ll need to stay the night. Best places to stay are the YMCA or the YWCA, both of which can arrange a boat for you. Otherwise just head out onto the main road and tell a rickshaw rider you want to go to ‘cheena mati pahar‘. Want to travel back to the Ancient times of medieval Muslim rulers & then the time of the Mughal Empire in East Bengal? Then visit Sonargaon – the once Ancient Bengal city, where you can experience the ruins and relics that date back to the Golden Era of Bengal. Sonargaon is one of the most beautiful places of Bangladesh to visit. 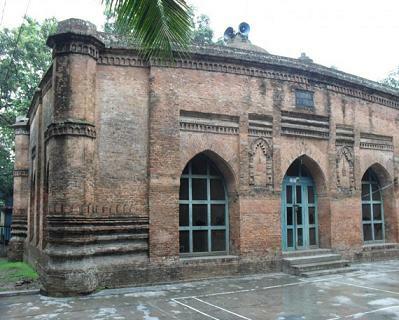 A great day trip from Dhaka (about 23km) is an excursion to Sonargaon (sometimes known as Old Sonargaon), the country’s first capital. 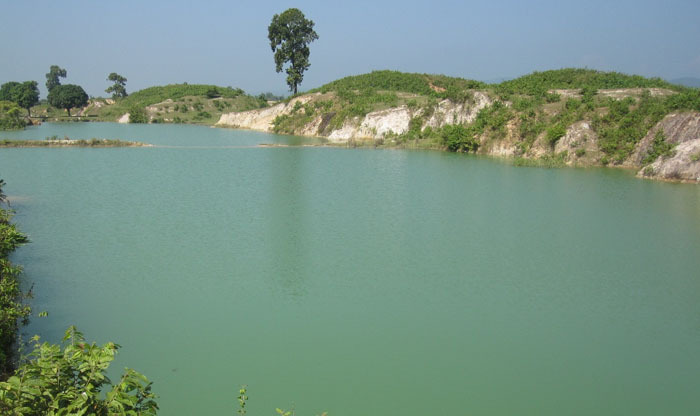 It is located in the Narayanganj district, about 27 kilometers to the southeast of Dhaka (the capital of Bangladesh). 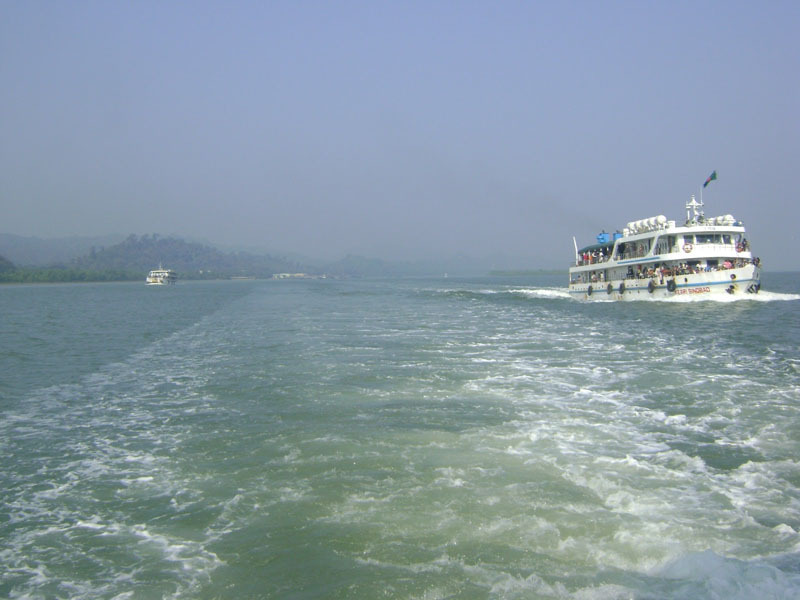 It is bounded on the east, west and south by the Meghna, the Shitalakhya and the Dhaleshwari rivers respectively and on the north by the Brahmaputra. Sonargaon combines the countryside, culture, archaeology, adventure and friendship in one tidy bundle. 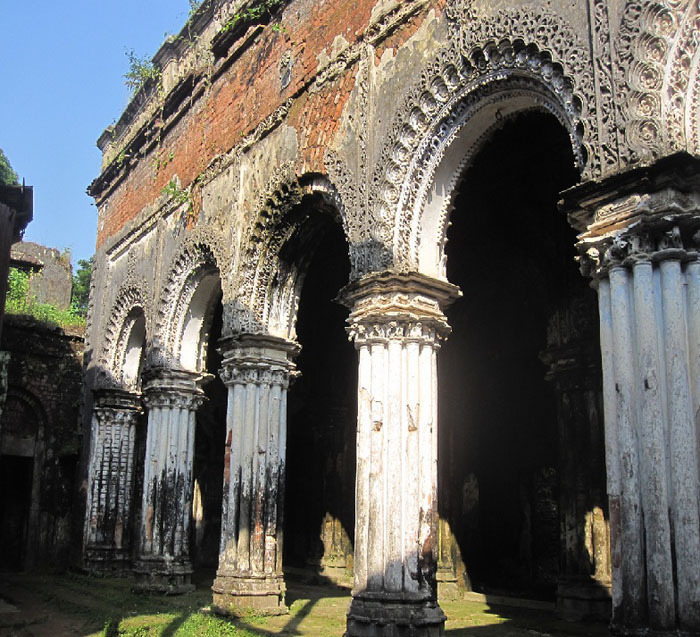 Except for some mosques, a bridge, a few tombs and stupas (Buddhist monuments), and some indistinguishable mounds (most of which are found around the small modern village of Mograpara), nothing much remains of the original city of Sonargaon. For most people, enchanting Painam Nagar is the real jewel. There are many beautiful places to see in Sonargaon such as the ‘Sardar Bari’ (the Folk Art Museum), Painam Nagar, Neel Kuthi, Tomb of Sultan Ghivasuddin Azam Shah, Panch Pir Dargah, Fateh Shah’s Mosque and the Goaldi Mosque. When visiting Sonargaon, it’s advised that you obtain as much information to ensure you have a journey you’ll always remember. 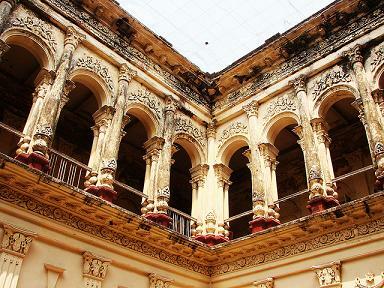 Now I’ll give you some of the highlights of Sonargaon you must not miss! The Folk Art Museum was established in 1975 to fulfill the dream of the celebrated painter Shilpacharya Zainul Abedin. He is a very famous artist in our country. He has a very rich collection of folk object of different materials. 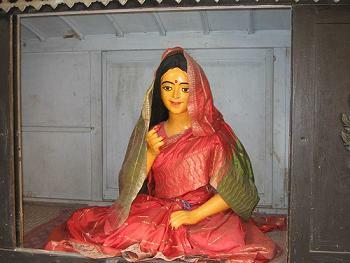 This museum is a national institution which represents traditional art such as various dolls & ornaments which are made by soil and made by the Chakmas (tribal group of Bangladesh). The village lives of the Chakmas tribe is represented and revealed by the Folk Art Museum. There are two galleries in this museum. One is the Wood Cutting gallery & another is the Embroidered Quilt & Jamdani Gallery. It’s important to note that the museum remains closed on Thursday & on all government holidays. The museum opens on Saturday to Wednesday at 10.00am to 5.00pm & on Friday at 10.00am to 12.00pm & 2.00pm to 5.00pm. The once elegant town of Painam Nagar is busy fighting a losing battle with nature, and with every passing year the trees and vines drape themselves a little further over the decaying houses. The result is a delightful ghost-town quality where the buildings appear to hang like exotic fruits from the branches of the trees. Constructed almost entirely between 1895 and 1905 on a small segment of the ancient capital city, this tiny settlement consists of a single narrow street, lined with around 50 (now dilapidated) mansions built by wealthy Hindu merchants. At the time of Partition, many owners fled to India, leaving their elegant homes in the care of poor tenants, who did nothing to maintain them. Most of the remaining owners pulled out during the anti-Hindu riots of 1964, which led up to the 1965 Indo-Pakistan War. Despite the rot, a few people do continue to live in some of the houses and their bright shades add a technicolour tint to the village. 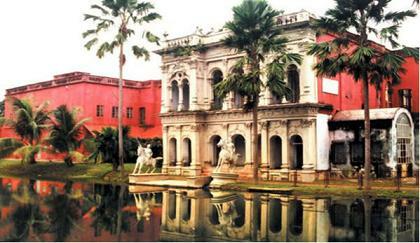 Neel Kuthi is one of the most attractive places in Sonargaon. 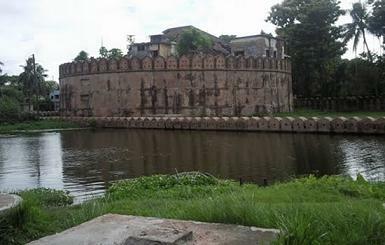 Neel kuthi was constructed by the English East India Company at Dalalpur in the vicinity of Panam of Sonargaon. 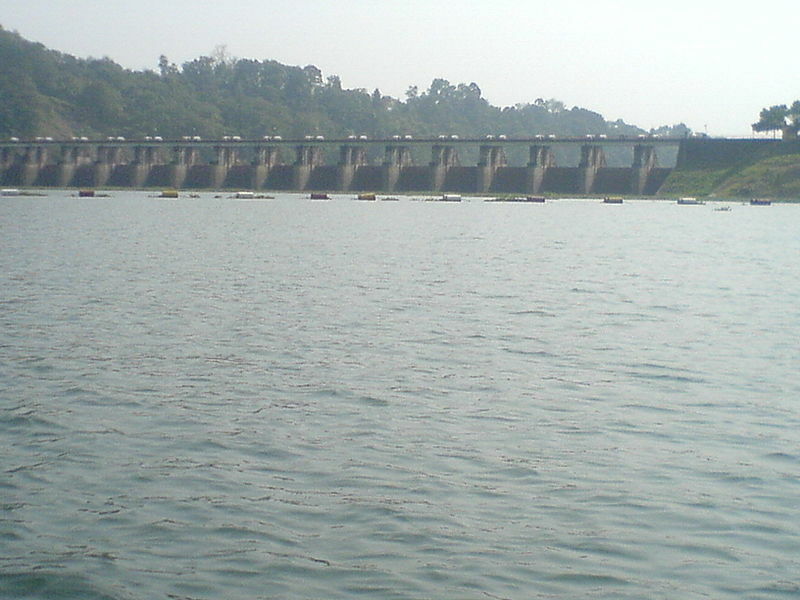 It is situated in the north of Dalalpur Bridge. Neel Kuthi was used for the processing of Indigo powder. It is also famous for Muslin. There is a large pond which was used by the weavers to wash their cotton threads to produce fire Muslin fabrics that earned fame across the world. 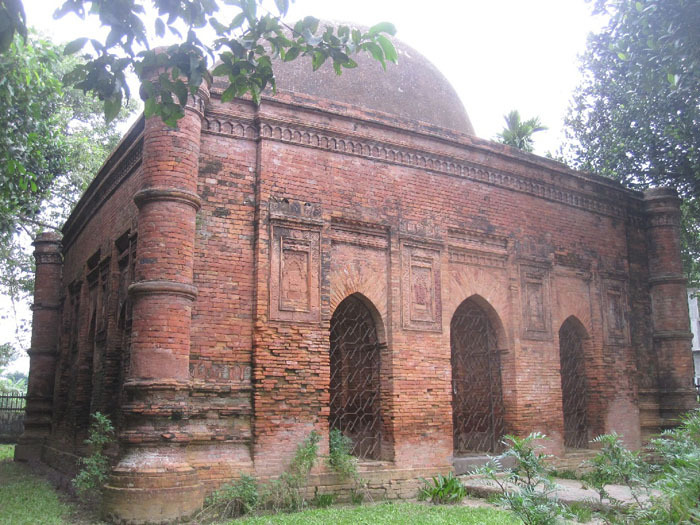 A thriving village located on the Dhaka-Chittagong Hwy, Mograpara claims most of the remains of the old capital, including the Tomb of Sultan Ghiyasuddin Azam Shah. These monuments aren’t very impressive and most visitors, believing only Painam Nagar to be Old Sonargaon, don’t even know they exist. A thriving village located on the Dhaka-Chittagong Hwy, Mograpara claims most of the remains of the old capital, including the Panch Pir Dargah. These monuments aren’t very impressive and most visitors, believing only Painam Nagar to be Old Sonargaon, don’t even know they exist. 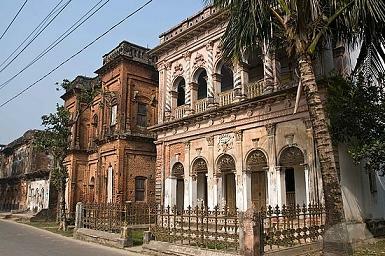 Painam Nagar was a 19th Century resort refuge from the fast pace of the old Bengali captial Sonargaon. 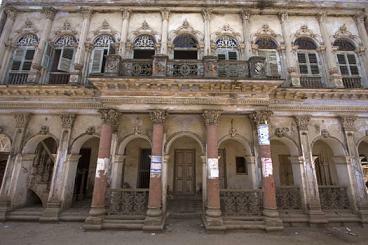 Along a single street prosperous merchants built mansions with columned facades, grand ballrooms and many rooms. Now it’s a ghost town of crumbling brick inhabited by a few Hindu families who offer to guide rare visitors through the dim musty rooms for a few taka. Another single-domed mosque in the Mograpara area, Fateh Shah’s Mosque, predates Goaldi Mosque by 35 years. It has been renovated rather than restored, and is consequently not as interesting. Built in 1519, the graceful, single-domed Goaldi Mosque is the most impressive of the few extant monuments of the old capital city, and a good example of pre-Mughal architecture. 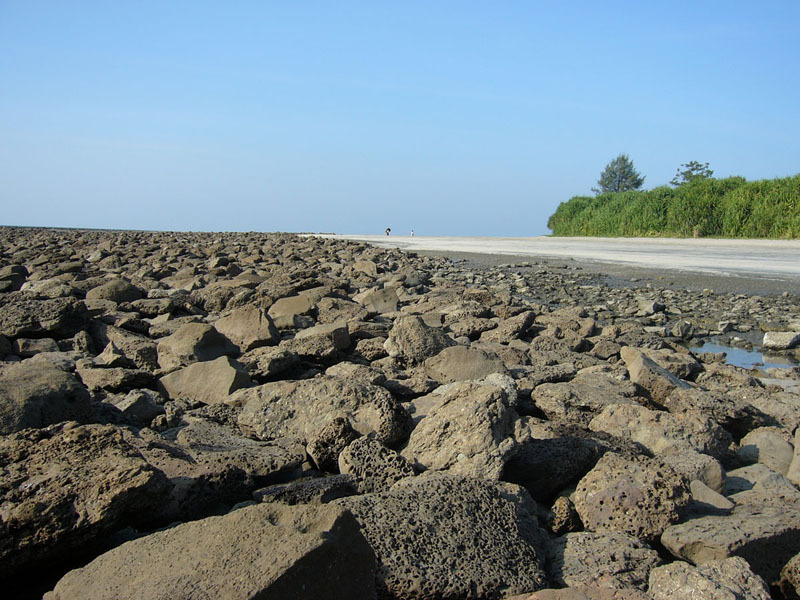 It is very easy to get there from Dhaka, Chittagong, Comilla or other districts of the country using the Dhaka-Chittagong Highway. But this highway is always very busy, thus you can expect big traffic jams on the road which can make you wait for a long time on the road.You can also go to Sonargaon by bus from Dhaka. From Gulistan, two services are available. They are: Borak Transport & Sonargaon Express. It takes 45 minutes to reach Sonargaon. Interested tourists may avail themselves of package tours which is offered by the Bangladesh Parjatan Corporation & Private Tour Operators. Sonargaon is not so far from Dhaka. You can get good accommodation at Dhaka City or Narayanganj. 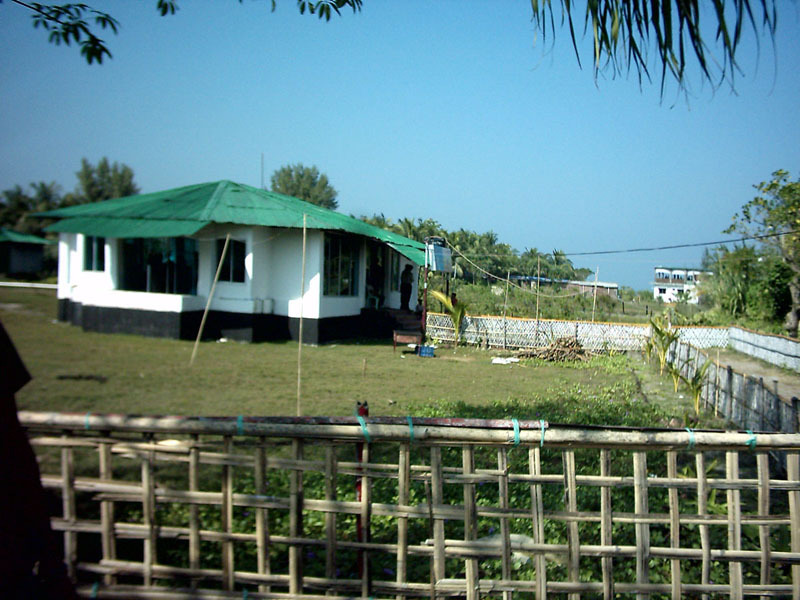 There are many hotels & lodging facilities in Dhaka & Narayanganj city. There is a rest house in the Folk Art Museum area as well. You can book that by contacting with the office of curator of the museum. Bangladeshi people are very hospitable. There is a small Cafeteria in Folk Art Museum where you can eat. There also many restaurants where you can take meals. All of Bangladesh is mourning the death of Bangladeshi legendary writer Humayun Ahmed. Humayun Ahmed aged 64 died last week in New York after a nine month battle with colorectal cancer. His body was returned to Dhaka from New York and honoured by thousands of people at the city’s famous Central Shaheed Minar monument. 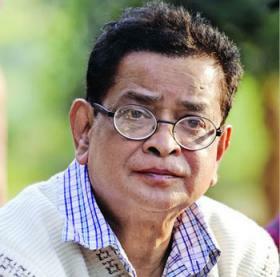 Humayun Ahmed is a famous best selling Bangladeshi author, dramatist, screenwriter, playwright and filmmaker. He made his debut in the Bengali literary world in the early 1970s with the publication of his first novel, Nondito Noreke with the help of Ahmed Sofa. Surprisingly, prior to his debut as an author, he was a former professor of Chemistry at the University of Dhaka. Since then, he became one of the most popular fiction writers of Bangladesh. The best-selling author was famous for his unique style of writing. 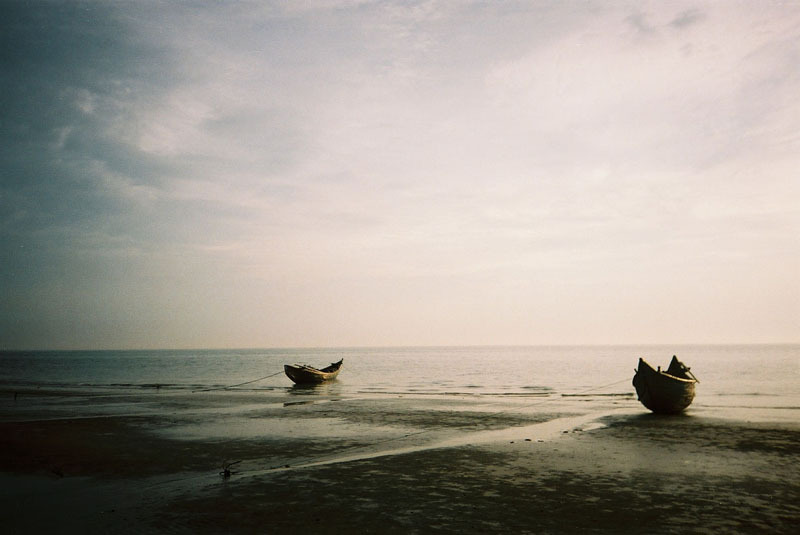 He was able to depict the tribulations of ordinary middle-class Bangladeshi life. 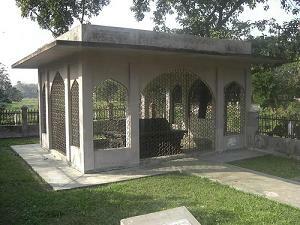 He used humour in his writings which apparently were very rare in Bengali writings. He was most popular for being able to create stories around supernatural events. In his novels, his characters could be described as eccentric, comic, and loveable. From novels and short stories, he went on to become a dramatist, screenwriter, playwright and filmmaker. Being able to capture the imagination of the Bangladeshi youth, he was idolised by an entire generation of young men and women who grew up in the 1980s and 1990s. As of February 2004, Humayun Ahmed continued to top the best sellers list of the Bangla Academy book fair (held annually in Bangladesh), an achievement that had been maintained over the previous two decades. In 2012 he was appointed as a special adviser to the Bangladesh Mission in the United Nations. Without a doubt, Humayun Ahmed’s death is a great loss for Bangladesh. He will no doubt always be considered a famous literary icon for Bangladesh from now and well into the future. He has made his country Bangladesh proud by enriching the world of Bengali literature and culture.